From Longman Dictionary of Contemporary Englishinterviewin‧ter‧view1 /ˈɪntəvjuː $ -ər-/ ●●● S2 W1 noun 1 [countable, uncountable]BOASK A QUESTION a formal meeting at which someone is asked questions in order to find out whether they are suitable for a job, course of study etcinterview for an interview for a job on the ‘Los Angeles Times’ a portfolio of work presented at interview2 [countable]ASK A QUESTIONFAMOUS an occasion when a famous person is asked questions about their life, experiences, or opinions for a newspaper, magazine, television programme etcinterview with an interview with the presidentnewspaper/radio/television interview Elton John gave an interview to Barbara Walters (=he answered her questions). an exclusive interview (=one that is given to only one newspaper, programme etc)3 [countable]PGOASK A QUESTION an official meeting with someone who asks you questions a police interviewCOLLOCATIONSverbshave an interviewShe has an interview next week for a teaching job in Paris.go for an interview (also attend an interview formal)I went for an interview at a software company yesterday.get an interviewHe was one of only five people to get an interview out of more than 100 people who applied. be called/invited for (an) interviewApplicants who are called for interview may be asked to have a medical exam.do an interview (also conduct an interview formal)The interview was conducted in French.give somebody an interview (=interview someone)We gave her an interview, but decided not to offer her the job.ADJECTIVES/NOUN + interviewa job interviewTry to predict the questions you might get in your job interview.an informal/formal interviewApplicants will normally have an informal interview with the manager.One out of every six candidates reached the formal interview.the first interview (also the preliminary interview formal)He felt the first interview had gone well.a second/follow-up interview (=a more detailed interview after you have been successful in a previous interview)She was asked back for a second interview.a mock interview (=one that you do for practice, rather than a real interview)Mock interviews are one way in which students can improve their job-seeking skills.a face-to-face interview (=in which people meet in person)I had to do a face-to-face interview followed by an entry test.a telephone interviewThe first stage is a telephone interview.interview + NOUNinterview techniqueThe book gives some useful advice on interview technique.an interview questionSome of the interview questions were quite difficult to answer.the interview panel (=the group of people interviewing someone)The interview panel were very impressed with her enthusiasm. 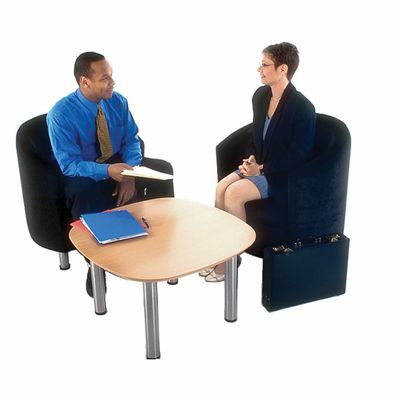 THESAURUSinterview a meeting in which someone is asked questions, to find out if they are suitable for a job, or to help the police find out about a crime. Also used about someone being asked questions on TV, in a newspaper, in a magazine etcI’ve got another job interview tomorrow. Since the police interview, she had changed her statement.an interview with Keith Richardsinterrogation an occasion when someone is asked a lot of questions for a long time in order to get information, sometimes using threats, usually by the police or the armyHe claims he was tortured during his interrogation.Police interrogation methods have been questioned.cross-examination an occasion when someone is asked questions about what they have just said, in order to see if they are telling the truth, especially in a court of lawUnder cross-examination, the only witness said she could not be sure about what she saw.consultation a meeting with a doctor or an expert to discuss treatment or to get adviceThe therapist charges $100 for a half hour consultation.Would you like to come back for another consultation?audience a formal meeting with a very important personHe was granted an audience with the Pope.